In 2007, the Foreign Missions Board was asked to consider appointing a full-time Faith Promise missionary who could focus primarily on serving Canada with Faith Promise services and promotion. After consideration, the board asked Harold and Helen Kinney to pray about this change of appointment. They did so, and at the Greensboro General Conference, this appointment was made. Harold Kinney was the Atlantic District’s district foreign missions director when they received appointment to Finland in May 1986. They were the first UPCI missionaries to be appointed to Finland and arrived on the field in September 1987. During the following year, he joined missionary Sam Balca in establishing contacts, transporting Bibles, and ministering in the Soviet Union. In October 1991 the Kinneys’ appointment expanded to include the newly independent Baltic Republics and Russia. They also served quite effectively in Norway, the Netherlands and Austria. 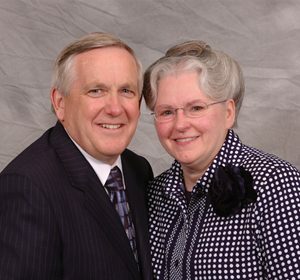 The Kinneys continue to serve the United Pentecostal Church as career missionaries based in North America and continue to depend on their faithful Partners In Missions for support. Faith Promise Representatives are not executives with Foreign Missions or World Evangelism Center but meet the critical need in North America of filling the many requests from our churches for Faith Promise services. For more information or to schedule a Faith Promise service with the Kinneys, please email hdmhkinney@aol.com or call him at 506-481-0346. John Leaman (better known as Jack) was born into a Pentecostal preacher’s home to parents who dearly loved the Lord. 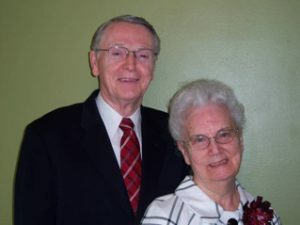 After graduating from high school in central Ohio and from Apostolic Bible Institute in St. Paul, Minnesota, the Leamans were invited by R. G. Cook in Lancaster, Ohio, to be his assistant pastor. Jack assisted Reverend Cook for seven years and then the Lord directed the Leamans to start a home missions work in Wausau, Wisconsin. Five years later Reverend Cook requested Jack to return to Lancaster. During the final years of pastoring, the church was eleventh in the nation in foreign missions giving. The Leamans’ life took on a new dimension when he was asked by Foreign Mission Division to assume the position of Director of Promotion and Publication, giving direction to deputizing missionaries. There he began promoting the Faith Promise program to churches that would financially support missionaries and other projects overseas. Over the past thirty plus years, he has had the privilege of holding over 1,450 Faith Promise commitment services in North America and overseas, seeing in excess of $56 million committed to reaching this lost world. For more information or to schedule a Faith Promise service with the Leamans, please email johnsleaman@yahoo.com or call him at 314-406-4324.